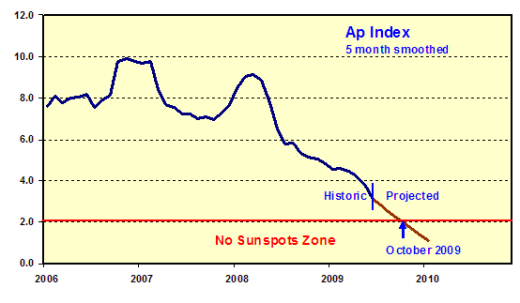 Archibald – The Ap Index says: "There will be no sunspots" | Watts Up With That? Archibald – The Ap Index says: "There will be no sunspots"
The Ap Index enters the no sunspots zone in October at its current glide slope. Will it pull out in time? The Sun is bleeding magnetic flux (for a very good reason), so I don’t think so. Frank Hill has shouted (his words) that there is no correlation between solar activity and climate. Back in a time when those who studied the Sun were armed with not much more than an enquiring mind, William Herschel in 1801 noted the relationship between the number of sunspots and wheat prices. When there were fewer spots, wheat prices were higher. To bring that up to the current day, when there are no spots at all, wheat prices will be the highest ever. Where B is the interplanetary magnetic field in nT and Vo is the solar wind speed in 100 km/s units. E.g. for B = 4 nT and V = 350 km/s, thus Vo = 3.5, we have Aa = 8.55 and Rmax = 57. So Aa = 8.55 corresponds to Ap = 3.87. June 23, 2009 in Science, Solar. Are you sure that the relationship will be linear at all readings of Ap? Many examples in non-climate systems where you get a lessening of decrease in Y axis as X axis trends to zero………. I think I see a great debate ahead. What Sun Spot Lightener Works Best? Find Out Before You Buy! wow….this is full of bold predictions. i LIKE that! easy to falsify and soon at that…..
i hope Dr Archibald is correct, because it will be so fun to see the spin…. Is this the same Archibald who predicted that the UAH May temperature anomaly would be -0.4°C? October 2009 is when the Hadron Collider will be trned on again apparently. I wonder if it’ll create some sunspots and some climate global warming change cooling?? So if I read Leif’s version correctly…we are probably in for a weak, but not anemic, solar cycle? I didn’t know where else to post this, (and since my computer is currently imitating a slug, I couldn’t do too much searching). I thought it interesting in light of the year 1913 and spotless days, and now we are going through a significant percentage of spotless days for the third year in a row while AGW has taken a vacation. 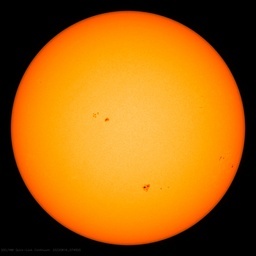 RW: would not laugh to soon he’s been right with about everything nearly everything especially sun minima, sunspots etc. Re temps have a look at this and tell me what might happen in June 2009 with global temps (AMSU ch 05 surface temps). He might have been off by maybe 1-2 months… Note: yellow line is 20 yr mean/average! It was a brave prediction and of course not correct, but at least it’s in the right direction of where temperature will most likely head. If you look at the woodfortrees data on SSN/temperature linkage then from what I can see it will b most likely be a -0.2 average anomoly by ~2013 and would probably take another cycle to get to -0.4 if you compare to past trends with degrees C/decade. What really annoys me most is the assumption by govt. here in Australia that temperature rise is completely man made. My kid at school is brain washed into this nonsense by left wing teachers who only have a right hemisphere brain. No offence to Picaso ! When I give the following input (0.2318 (4 (3.5)^2)^0.9478) in http://www.wolframalpha.com, it gives me 9.27003 (and not 8.55). Can someone correct me? Thanks. While I notice Leif and David do not see eye to eye, I feel they are both on the right side of the line. That is that cycle 24 will be significantly weaker than 23. 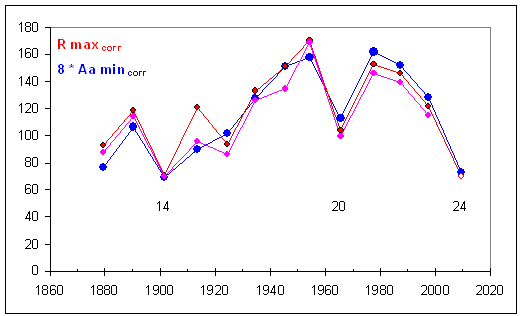 Correlation may not prove causation, but falling temperatures and reduced solar activity may soon be hard to ignore. I am guessing that solar scientists will soon have to provide more than predictions for space vehicle insurance premiums. People will want to know which of Jack Eddy’s “many plugs” are important and what regulates solar cycles. Putting a spanner in the cogs of the AGW hoax is one thing, finding out if we will have enough to eat is quite another. Yes, June is shaping up to be a rather cool month (anomaly wise). I think it has a very decent chance of coming in under June ’08. David may have only been 1 month off. Long ago there was a study that defined excellent decision makers as those who were right about 45 percent of the time when working from insufficient data. I.E., it was found “being right about half the time” (working from insufficient data) makes for successful projects and very profitable operations. So, if Archibald has been “right” about half the time, I’m impressed. Anyhow, as another posted, it would be fun to see what happens if we hit another major solar minimum. On the other hand, I suppose it would be even more fun if “warming” resulted in a few extra degrees because its getting cold where I live (June has virtually gone AWOL). The problem with predictions is that they are, usually, wrong. AIDS pandemic (Although AIDS is a big problem). Global warming (Post cooling period). With CO2 “pollution” and “climate change” we are more at risk from Govn’t policy and political spin. Storm the gates I say!! Storm the gates of power…they need a wake up call. One question I’ve had is about the accuracy of the historical record of sunspots. Would some of the sunspots that are being observed now that appear and fade rapidly even have been counted in earlier centuries? In other words, was there a possible under count in the early years of solar observation? World temps. are decreasing since 2001, 8.5 years. This is why we now have “climate change” instead of “global warming”. 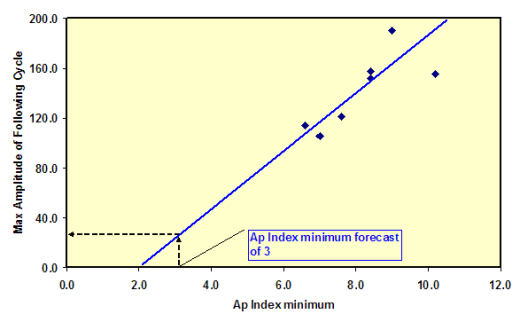 [Archibald] Earlier this year I produced this graph of the Ap Index plotted against solar cycle maxima when I thought that the Ap Index would bottom out at three, giving a maximum amplitude of 25. That’s a pretty long leap from your plotted spots (observed lowest minimum of about 6.5) to your extrapolated 3. I’d be a bit nervous about whether a 1st order polynomial is the appropriate relationship, but at least it will provide a useful datapoint in the future. At least it will be easy to test, assuming we have any faith in the official spot counters. > 4 nT – Is that nano Torr? nanoTeslas – magnetic field strength. correlation is not causation, but anti-correlation is worse. CO2 continues to increase. temps fall. gorebull warmingers have some explaining to do. they often claim that recent “non-warmng” is due to “natural” factors temporarily overwhelming CO2. however, they ignore the simple fact that if natural factors can be responsible for cooling, the same natural factors very likely play a significant role in recent warming, too. Remember. Livingston/Penn predicted this based on barycenter analysis of the sun. David Archibald highlights this in his 07 paper. Both noted that Maunder similarities where in the offing for sun/angular momentum activity for the next 30 years. What I see evolving here is just that kind of scenario. Taking a “lief” out of Herschel’s book, I will be watching the world grain prices over the coming 12 months, whilst keeping an eye on Sunspot activity. Estimates suggest that production may well be down this year already due to poor weather conditions. Making predictions using hi-tech hardware & software is infallible like all technology, right up to the point it lets you down when you need it most! If we are heading into a prolonged minimum, & that may be a big IF, then the world should be planning for all eventuallities & not just on one role of the dice! (1) has SC24 started yet or are we still arguing about that? (2) there isn’t much data for projecting AP index or even Ap for that matter in a current minimum so could it be that they aren’t linear? (3) What has been the consensus of the AGW scientists about this minimum? (4) What about the moderate real scientists like Dr Meier saying now that we clearly have a reversal of 20th century warming yet CO2 levels keep advancing? (5) Have the modelers starting adjusting there forcing factor from 2 to account for this cooling in the last several years? DA’s report is in contrast to the monkeypuzzle counting system that had 2 sets of sunspot groups counted THIS morning, when 1022 was dead long before sunrise yesterday (22nd June 2009). A counting system, unlike the funny Google ad spots, isn’t a laughing matter. There are institutions & people out there that need to be taken to task. This will do nicely. Well, our two duelling solarists say a weak cycle of Rmax between 25 to 60. That’s what I get on my 25+ year-old HP-11C. ABSTRACT. Geomagnetic activity late in the sunspot cycle has been used successfully to forecast the amplitude of the following cycle. This success is somewhat surprising, however, because the recurrent high-speed wind streams that trigger the activity are not proxies of the Sun’s polar fields, whose strength is a critical factor in many solar dynamo models. Instead, recurrent geomagnetic activity signals increases in the Sun’s equatorial dipole moment, which decays on the ~1-2 yr timescale of the surface meridional flow and does not survive into the next cycle. In accordance with the original empirical method of Ohl, we therefore argue that solar cycle predictions should be based on the minimum level of geomagnetic activity, which is determined by the Sun’s axial dipole strength, not on the peak activity during the declining phase of the cycle. On physical grounds, we suggest that an even better indicator would be the total open flux (or strength of the radial interplanetary field component) at sunspot minimum, which in turn can be derived from the historical aa index by removing the contribution of the solar wind speed. This predictor yields a peak yearly sunspot number R max = 97 ± 25 for solar cycle 24. No time to look deeper, sorry. Do you have a graph of AP against sunspot activity for previous cycles? You will have to explain yourself more – what is your argument here? How does this tie into your solar jetstream theory? Will not a slower jetstream progression result in reduced sunspot activity? Do you mean ‘cycles’ (plural) in this sentence? It makes no sense otherwise. And what is the difference between the zeros and plusses in this second diagram? Is one Ap and the other Aa? If so, it is not marked correctly. And anyway, if you use a broad felt-tip, instead of a fine-point nib, I still see a good correlation in these purple plusses. The lower the Aa (or should that read Ap?) the lower the sunspot number. And just one more observation. There is little difference between these two arguments. Archibald is predicting an Ap below 2.0, which will result in no sunspots for the next cycle. Svalgaard estimates that Ap is half Aa, and if you plot 2 x 2 = 4 on his Aa graph, you end up with an Rmax of sunspots for the next cycle of just 15 or so. Very much the same result. So the critical point here is whether that Aa / Ap trend line will continue downwards. Are there any pointers to whether this will be so, or are there any indications it swing upwards soon? Of course you’re right about the plural with “cycle”. If I understood the plot correctly, R^2 for the “purple plusses” is 0.1557. That means no correlation. The human eye can dream up a lot of things, that’s why we use mathematical rigor whenever we can. for years NOAA and NASA have recorded TSI in the 1366 W/m2 range. Then they launched SORCE and come up with TSI in the 1361 range. I would suggest that current price trends of a now global commodity would bear little relation to the regional production of a crop produced before modern farming practices, fertilizer, weed control, irrigation, seed stocks, price supports, and import/export of surplus production. Year-to-year yields of small regions over a short-ish time period would certainly be a decent indicator of a growing season’s weather. But even for the length of a single solar cycle you would have to look at many other factors which could change conditions significantly. I am not taking a “side” in this, but I do very much want to note the measurable predictions and keep track of how they pan out. Just a basic question here; on your first graph; you are showing an x intercept, and assuming a linear relationship. Would it make more sense to pitch the outlyer at (10,160) and view it as either parabolic or hyperbolic and show a y intercept (or vertex) somewhere around 50 to 60. I realize I’m in way over my head here, but one of those data points looks seriously like an anomaly in an otherwise nearly normal parabolic distribution, and the data points make this event outside of any current experience. These types of physics functions never seem to be truely linear, at least in my limited experience. Just a layman’s observation, your patience is appreciated. Puttng the counting problem to one side, have you noticed any qualitative difference over time in the Solar Cycle 24 spots? Wang and Shirley are way out because they called the minimum a couple of years too early. Maybe we could have a thread called that and we could discuss there what endogenous variable is to blame for nipply weather in your corner of the world. Can we just talk about the Sun and learn about it before we ascribe connections that are, so far, completely unmechanized!?!?!?!? Please!?!?!?!?! So to that end, I have a question. Which filtered version of the Sun is best for viewing plages that are there but the lack of heat differences cause the spot to be a Cheshire cat? The reason why I ask is that according to Leif’s charts, while the SSN tanks now and then, the other indices are still creeping up. Is there a filtered view of the Sun that shows this? I missed the “very good reason” of why the sun is bleeding magnetic flux. Do you mind repeating it for those of us who missed it? My bad. You number is correct. Numbers that depend on it should then be corrected correspondingly. Not that it changes anything, as by input 4 nT and 350 km/s were just for illustration. Livingston/Penn predicted this based on barycenter analysis of the sun. No, not at all. Based on an extrapolation of their own measurements. They are not barycenter cult followers. That Aa for 2009 [so far] is 9.2 and Ap for 2009 [so far] is 4.3, none of which lead to an extremely small sunspot number. Extrapolating to much smaller values of either Aa or Ap is not warranted based of the historical record, although one can always do this just for fun. For each minimum [of which there are many] one can plot Rmax for the next cycle [the circles] or for the previous cycle [plusses]. The square of the correlation coefficient [the R2] is 0.8855 for the first case [good correlation], but only 0.1557 for the second case [poor correlation]. The critical point is not whether Ap is half Aa, it is that almost by definition as Ap is measured in 2 nT units while Aa is measured in 1 nT units – I know this is silly, but that is the way it is by historical accident. the point is whether Ap will reach 2 [or Aa 4], and there is no evidence for that. This is a difficult measurement and different spacecraft instruments give slightly different results. Probably the SORCE data is the better. The absolute value, whether it is 1366 or 1361, is not really important. What is important is the ‘relative’ precision, i.e. the variation from day to day measured by a single instrument and that is much better, the error is about 0.007 W/m2. So the ‘wiggles’ as seen by one instrument compared with the ‘wiggles’ seen by another agree to with much higher precision than the 5 W/m2 difference between spacecrafts. Very cool, wet June here in New Hampshire, and currently experiencing a nor’easter stuck off the coast, cranking cool wet weather at us from the northeast for the past few days, continuing into tomorrow. Mostly, daytime highs have been pretty much stuck in the 50’s and 60’s all month, while normally they should be in the 70’s and 80’s. Weather is not climate, but this is truly weird. I am convinced that cooling is upon us, and that it will continue indefinitely. It can’t come soon enough, to help put an end to AGW/CC hysteria . Those who stand to gain financially and politically from continuing the fraud are too many, and too powerful at this point to stop. But, we sure as heck can throw monkey wrenches into the works and slow them down, as well as Nature doing her part. The actual Deniers are now the Warmistas, who are desperately trying to deny or ignore that we’re cooling, or saying that it’s just part of (manmade) climate change. Might be hard to do [so I’m also curious]. The Sun is not ‘bleeding’ magnetic flux. On the contrary, the new cycle activity is adding flux to the photosphere. The reason that Ap [and Aa] is so low now is that the high-speed streams that we often observe occurring in the downslope of a solar cycle are finally dying down and the solar wind speed is getting down below 350 km/sec characteristic of ‘true’ solar minimum. Since Ap [and Aa] depends on the square of the solar wind speed, that has a large calming influence. The magnetic field has not decreased much [and won’t, as new flux is emerging], so the recent decrease of Ap is due to the disappearance of the high-speed streams, and we can’t have less streams than no streams, so Ap won’t fall much more. Which filtered version of the Sun is best for viewing plages that are there but the lack of heat differences cause the spot to be a Cheshire cat? The reason why I ask is that according to Leif’s charts, while the SSN tanks now and then, the other indices are still creeping up. Is there a filtered view of the Sun that shows this? In the last year of observation, is there anything that causes you to revise downward your prediction of a smoothed sunspot number of ~75? Basically: no. Our prediction paper formally [and on flimsy ground] suggested taking the average polar fields over the three years prior to solar minimum as the predictor. Since the polar fields stabilized at the end of 2003 and have been rather constant since, perhaps it is better to use the average since then as predictor [in which case the value would not change], rather than strictly the average over the last three years, in which case the prediction would be ~70. Both values are not significantly different, so pick yours. Perhaps one in the middle [~72] would be better, but that is just hand waving. In any case, what we really are predicting is not sunspots per se, but the number of magnetic active regions because what goes in is the magnetic field, so that is what comes out. In the past there were 12 ‘spots’ per region, so our prediction is 72/12 = 6 regions. Livingston & Penn may show us that the visibility of these regions changes with time, so perhaps the sunspot number as such may not be a good indicator. Active region count is perhaps better, or average magnetic flux, or F10.7, or Ca-II-K-line, or … It will be interesting to see how the solar community will struggle with this question, should L&P turn out to be correct. I am convinced that cooling is upon us, and that it will continue indefinitely. This is, of course, ridiculous. Perhaps as ridiculous as the AGW proclamations. There could be cooling, even significant cooling, which will take some adjusting to. However, it will not be indefinite … at some time the good times will return. Actually, that’s just RSS not the woodfortrees composite. paper is a rehash of an old forecast or a new one. Cooling will never occur indefinately, the climate goes in cycles and will get warm or cold depending on where you are in the cycle, we may have another little Ice Age later this century and then have a future equivalent of the Medieval Warm Period in the 23rd century. Interesting to see these boxing matches between Archibald and Lief, about UAH there has been a small uptick in temps. recently, but it’s still below the yellow line and isn’t as sharp a rise as the last uptick. For our area we’re currently in the first extended heatwave of the year, but should be dissipating next week so it isn’t a record length by any means. Can anyone locate an Ap graph superimposed upon sunspot number – for the last three cycles? I’m not curious enough to know if the paper is a rehash of an old forecast or a new one. It is basically the same story: The minimum value of Aa [or Ap] is a good predictor of Rmax for the next cycle. Since Aa for 2009 [~9] will be lower than that for 2008 [~14], their prediction should be scaled down correspondingly to make it closer to my Rmax ~70 prediction. There seems to be general agreement that the next cycle will be about in that range, not a super cycle and not a Grand Minimum, but ‘the smallest in a 100 years’. why three cycles, when seven cycles are available? A different way to look at this is to plot the data as a time series, here is Rmax (next) [red points] as a function of time for 13 cycles. Also plotted is simply 8 * Aa at the minimum preceding the cycle. As you can see it is not a bad predictor. You will note that there is also a pink curve. That shows the second largest sunspot number yearly average, and one could kind of take the average of the red and pink curves to obtain a smoothed value [although I’m only lukewarm for smoothing]. The last red point is the open circle, indicating that that is just a prediction, not observed [yet]. The Aa [Ap] method doesn’t look too bad. Polar fields are still moving in the opposite directions; intensity of the South is now almost twice the North’s (67 vs 34 nT). Judging by the previous cycles this minimum may not be over as yet. >>why three cycles, when seven cycles are available? Where? I have found them separately, but not superimposed. It would help in seeing the trends. This kind of wiggle matching has no signeificance. Try to plot the difference between N and S and watch how that moves all over the place, unrelated to the phase of the cycle. Also, plot the real data, not the filtered data. The difference N-S takes out the annual modulation, so no need for filtering. No, the values are -46N and 52S. Just where they should be, as we are close to the time of year where they should be equal [June 6th]. In the coming weeks the North will overtake the South as it always does as we move towards Fall, to eventually become twice as strong on September 7th. Do not become confused by end-effects of imperfect filtering. Your making to much about the readings and your not considering the descending part of this cycle 23, which then would have an effect upon the developmental behavior of Cycle 24. So this is much different then saying A + B = C.
The bottom line is if you are taught to think within the box then you will never be able to think outside of it. At least not naturally. Because your instincts unfortunately always pull you back in. Yes, Richard Sharpe, as you say “at some time the good times will return.” That was my meaning of the word “indefinite”. Not defined. Chill, dude. might be helpful, then. 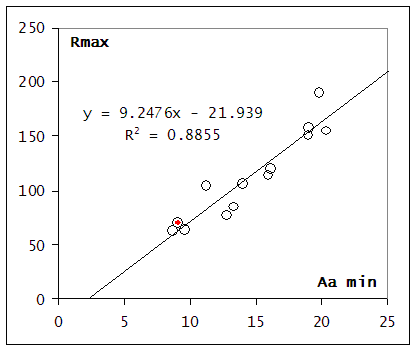 I have marked the Aa-minima by red dots. I had already submitted a response but the system seems to have lost it ……short version….I guess I should pinch myself because I find myself agreeing with what Leif has been saying on a couple of issues, AP readings , Polar fields differences, etc…. On another note. Many forecast are out there now as well as schemes. Some think they have merit, others do not. Even from within the solar field. But I always like to see results and this is why I have put out time periods over the years to watch for activity level spikes. Since 3-5 years, or even longer, is an awfully long time to wait for results. Both good and bad. Now my forecast from a while back, that I even mentioned around here, is bearing fruit. I’m referring to my prediction that we would see the highest activity level since March 2008 in June. an upswing in June, in which I said that it would the highest level since March 2008, is bearing fruit. I grow apples, not commercially, but for fun. I grow them in the south of England. I grow some cookers (Bramleys) and some trees purchased from a farmer in Somerset; I don’t know what cultivar they are but they make the very best scrumpy (a powerful alcoholic beverage only distantly related to cider). This year my Bramleys are half the size they should be. There’s no June drop (when the bigger apples force the smaller ones off the branches) as the Bramleys are still the size of golf balls, not bigger than tennis balls which they ought to be at this time of year. The scrumpy apples (which need sun and heat to make the sweet juices) are producing little or nothing. My apple trees are my measure of what the sun is doing, and the sun is simply not doing enough. No numbers; no speculation; just observation of nature tells me that something’s wrong. >>It would help in seeing the trends. As I suspected, Ap lags behind Ri sunspots. Thus sunspot numbers should recover before the low-point in Ap is reached. Ergo, one might say, we have not reached the minimum Ap/Aa as yet, and Archibald may be the more correct here. A 20nhz low pass filtered values eliminate yearly geometric projection effects. Here is a chart for last 5 years with both sides of the argument. As they say: “You pays your money and you takes your choice.” My choice is clear: filtered data. About a month ago my cat (American long hair) started shedding more than usual. We have now had some really hot and humid temps for a couple of weeks and less rain than usual for this time of year. I blame in on wind direction, we have had a steady dose of north winds coming down the center of the state (Florida) rather than across from either coast. Less moisture, less thunderstorms, less rain, less cooling, more heat. Just weather. As I suspected, Ap lags behind Ri sunspots. Thus sunspot numbers should recover before the low-point in Ap is reached. It is more complicated than that. The lag occurs for large cycles, but not for small cycles. The reason has to do with the evolution of high-speed streams and associated coronal holes. When the streams are dead, Ap won’t go any lower, which is happening at this minimum. Good examples are 1878-1879, 1901-1902, and 1912-1913, and I believe 2008-2009. Saying that an upcoming one is expected, because there is a good chance that we have reached solar minimum (Guessing this is your your reasoning with your upswing graph), is completely different than specifically calling for a June spike, and also saying it would be the highest since March 2008. Mind you I know that you have a case because of the lack of details I supplied for my reasoning but that’s a whole different arguement altogether. …would it not be better to make predictions about 10.7 flux, or Aa, or Ap or *ANYTHING BUT SUNSPOT NUMBER*? A broken yardstick is worse than useless. Can you change your predictions to 10.7 flux or one of the A indices, or at least make parallel predictions for them? b) I believe Dr Hansen’s degree is in astrophysics. If anything, he has more credentials to talk about sunspots than climate. If we try to keep sunspots as a metric, the count will have to be adjusted somehow, and I could see NASA, and their employee Dr. Hansen, being involved in the process. GISS/Hansen-adjusted temperatures are controversial, as it is, We do *NOT* want to get into GISS/Hansen-adjusted sunspot numbers. 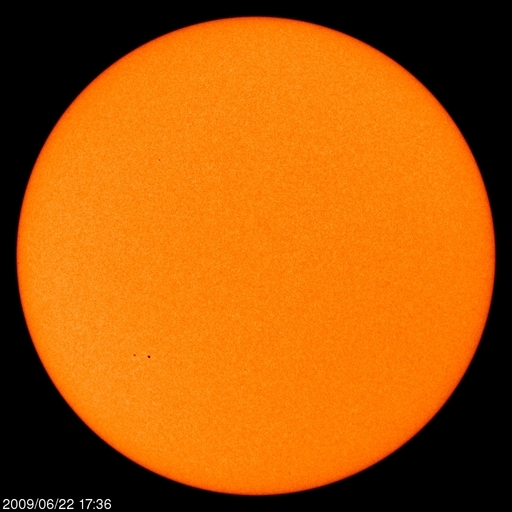 Sunspots have served us well for 3 centuries, but they are now broken. Let’s retire them now, at least until the Livingston-Penn effect reverses. Which also shows the undesirable side effect of introducing spurious end-effects. As the two values approach each other the filtered data diverges. Sometimes it pays to listen to reason. The curve at the bottom is the difference N-S. It shows no strong divergence recently, if anything a slight decrease [as we would expect since cycle 24 has already begun to eat away at the polar fields]. cherry picking is what I call it. MC (05:06:18) “Livingston/Penn predicted this based on barycenter analysis of the sun. I am curious to know where you got this notion MC. My best guess, based on a google search, is BAUT – and that you reached this (perhaps speculative) viewpoint by merging different pieces of information that arose in different threads there. is completely different than specifically calling for a June spike, and also saying it would be the highest since March 2008. It is not a ‘June’ spike. It is a May-June spike. In May there were about 11 ‘region days’ and in June we have had 13 so far. A ‘region day’ is the number of days in the months there was a region on the disk. If there were two, the day would be counted twice, etc. As F10.7 already back in April was above the background level of a year ago, it was clear that something was coming. I don’t place much emphasis on such details as you clearly missed the Oct-Nov spike that was almost as big [combined count 20 – compared to March 2008 which was 26 (and that was SC23 spots) and to the May-Jun spike sitting at 24] . You can make it more impressing to show me where and when you predicted the June spike, and forgive me for not keeping track of everything. As I already pointed out I predict a region number [namely 6]. That can be converted into equivalent sunspot, F10.7, whatever. You other point is well taken. People will jump on this in ways that suit their own purposes. People predicting a Grand Minimum would say that the L&P deflated SSN is good because it agrees with their own views. Other groups would try to bend the numbers to whatever they and once you slide down that slope reason goes out eh door and politics takes over. I don’t see any solution yet, but the problem is one the solar physics community will have to come to grips with in the near future. Vukcevic, thanks for making me aware of some interesting features of a time series which I have not previously been inspired to study carefully. Leif is right about edge-effects – if you are going to apply a filter, you should either snip the edges (my preference) or mark them clearly for your audience. Hey, serious props to Frank Hill for making a prediction that can be tested in 6 months. That bears a suspicious resemblance to the scientific method, which all too many climatologists have not the least interest in. > been 1 month off. * a straight projection from UAH daily to Hadley/GISS/USAH/RSS doesn’t work. Period. End of story. * If I wait until RSS comes in, and adjust my Hadley and GISS projections based on the delta between RSS actual versus RSS, and the relative slopes of the regressions, the fit has been pretty good the past couple of months. Surprisingly, UAH daily to UAH monthly still doesn’t work. This month might break my Hadly+GISS projections, because it showed them almost identical before the temps picked up the past 4 days. Hadley temps do occasionly come in higher than GISS, but it’s not very common. It is not a June spike. It is a May-June spike. In May there were about 11 ‘region days’ and in June we have had 13 so far. A ‘region day’ is the number of days in the months there was a region on the disk. If there were two, the day would be counted twice, etc. As F10.7 already back in April was above the background level of a year ago, it was clear that something was coming. I don’t place much emphasis on such details as you clearly missed the Oct-Nov spike that was almost as big [combined count 20 – compared to March 2008 which was 26 (and that was SC23 spots) and to the May-Jun spike sitting at 24] . You can make it more impressing to show me where and when you predicted the June spike, and forgive me for not keeping track of everything. And it does not matter how many days May ended up anyway with just like it would not matter if a long range weather forecaster had forecasted “January” to be much colder than average, but the colder anomalies arrived slightly earlier. But December still ended up being warm or much less cool. So May is like December in this analogy. As far as my prior forecast comments and you now forgetting….???. I know that we had an exchange about this when I first started posting around here, which I believe was late April. And I mentioned the June forecast that I had previously put out and many in the meteorological field knew about it. And they were interested in this outlook because many are now starting to strongly consider the solar-ENSO connection as well as many other possible relationships. And I’ve got a proven track record over the years with my solar based ENSO calls. So they follow-monitor my forecasts. As far as my prior forecast comments and you now forgetting….???. Yeah, it didn’t seem important to remember. exchange about this when I first started posting around here, which I believe was late April. 2008 or 2009? If 2009 I’m not impressed. I’ll predict right now that June 2010 will be twice that of June 2009. Don’t you use the planets or something? I don’t remember what you use. Or maybe you never told anybody and that is why. So you should be able to do this thousands of years ahead, right. According to this the spots will return soon. Yes, during most of the solar cycle there are spots every day. Over time, there are two periods: One is when they intitally appeared, grew more visible, then grew much less visible into most of 2009 so far, where it was hard to see any of them that were reported. Now, we have 2 very good ones, but NO penumbras. The day of May 16th, early in the morning, I saw the one and only penumbra for an SC24 spot. So, I would say, for now, there is a possibility of growing visibility to a peak and back down again, and over time the spots themselves will grow larger. It’s been slow & painful to watch. One thing seems to not change with this cycle: The Sun does not want to turn on a dime (read ramp). Present spots included. The lack of Penumbra has been overwhelmingly strong and persistent. Tomorrow, everything could change, but I wouldn’t hold my breath. Make that the 17th of May for the penumbra seen. Thanks to Dr Svalgaard, we have another measure of when the Sun enters the no sunspots zone. At its current decline rate, the aa Index will be there in February. Thankyou for that. If the data can be quantified, it would make a good post. It would seem that from these postings, that although Dr Svaalgard and D Archibald are competing beasts, BOTH their predictions were closer than those of the “official NASA etc”. IT seems that their reasoning is also closer. DR Svaalgards contributions are very enlightening and put a “hold” on overexcited amateurs such as myself. I admire D Archibalds bold statements which like mine are a bit over the top (ie -0.4C for May 2009). However its pretty close (see June 2009 AMSU trends, will be negative or 0, unless major satellite adjustments). The fact is its seems, that temps have stabilized and may be on the way down.. Whether this is due to solar activity remains to be seen. From what I gather Dr Svaalgard does not agree with the Solar-Temp connection, whereas D Archibald does? We should thank them both for the invaluable contributions. It’s silly remarks like this that make me question what your true motive is around here sometimes. Because you have compared apples and oranges on more than one occasion to make a point. But I’ve dealt with some of the elite long range weather forecasters in the past, about many different forecasting subject matters, so I’m not one of these individuals who is going to bow to someone because others have chosen them to be the “expert” on the subject matter. And most of them have learned from experience that it’s just better to sit back then to be made a fool of. Because I have shown before that their prior beliefs of what is possible, long range wise, and with specifics, were dead wrong. And your belief system, or at least from what I have been reading from you, fit this criteria. And like I have said before. Being able to forecast is much different than having specific knowledge of things. Much like a college professor would not necessarily be a great long range weather forecaster just because he or she teaches the science involved with meteorology. I think this should be a piece of cake for you since it’s only a few months out and we’re headed up, right? I look forward to hearing your forecast. And yes I consider the planetary influence upon the sun as well as the cyclical nature of it with the Golden Section-harmonics. What did I reference or talk about ? The importance of the waxing and waning of the poles and their differential values. But I included the qbo in all of this as well as the polarities. And FWIW , I used the filtered values. I think it is not possible to forecast any of this except in a general sense. As you have not provided specifics [nor a skill score chart] your forecast cannot be evaluated. You talk about a June spike; this implies that you forecast that July and possibly August will have significantly smaller activity, otherwise you are just saying that the cycle is generally ramping up, which nobody would consider a specific forecast [F10.7 suggested several month ago that the minimum is past]. A plage is the more fundamental phenomenon than a spot. The plage appears before the spot and endures after the spot, so is what we should count [and is what we would have counted in the past, if we just could]. That TSI has its 0.1% solar cycle variation with a maximum at solar maximum is because the plage positive contribution outweighs the sunspot negative contribution by a factor of two. It doesn’t matter who does the filtering, and the end-effect is not taken care of correctly, as is evident from the data. The 15-day lag does nothing to cure a 182-day end-effect. To get rid of the annual variation simply compute the difference between unfiltered North and South, then you can see that there is no divergence. Please do that for us. Therein lies the problem: The data has been collected, it just has been poorly quantified or passed off. For a quick look, you’ll have to go to solarcycle24.com, in the website content selector box, choose ‘Cycle 24 Photo Tmeline’ and have a look around. Look at http://www.vds-sonne.de/gem/res/rezahl/numbers09.lst and compare to the photo timeline: Whose List is accurately refecting the sunspot #? The people with the official job title or volunteers? This is every bit as bad as the temperature recording system that anthony has taken up cause to bring to the light of day. Stephen Brown, it’s a good thing you are not a commercial farmer. Your reliance on what the Sun is doing to your fruit’s lack of growth is just incomprehensible to me. The weather drivers in your area will tell you why your fruit is not growing. And the drivers are best understood from the equatorial belt through the oceanic oscillations, into the atmosphere and then onto the jet stream, and finally at the regional front/pressure gradient behaviors. Your local weather pattern variation will most likely follow known geographic variables (IE North slope versus South slope, leeward versus windward, low versus high ground, etc). A case in point. Less weather knowledgeable farmers in our area cut hay early last week because they thought it had grown enough and they wanted the second cutting to start growing. Besides, this first cutting has done well under good moisture. It will be a bumper crop. Made these newer farmers want to cut it so the next bumper crop can get going. The temptation was overwhelming. However, the old farmers held off because the unstable weather pattern was setting up for continued moist air, continued rain, and even downpours. The new farmers now have rotting hay. The old farmers are following weather charts to determine when it will be safe to cut, dry, and bail. They are NOT looking at the Sun. They could care less what the Sun is doing. The Pacific Ocean, jet stream and unstable air masses are telling them what to do. Which means that old farmers will get two cuttings. New farmers destroyed their first cutting. There is NO consistent correlation through minimum to maximum and back down again to weather pattern variation and subsequent agricultural productivity. Crops grow, fry, drown, or freeze because of endogenous variables. You should learn what they are and understand how they affect vegetation before trying any kind of commercial agricultural endeavor. Another case in point. Someone should have told transplanted Californians about that tip before sinking money into vineyards above the 45th parallel. Vineyard creep to ever higher latitudes has followed the PDO warm phase over the past 50 years. Trouble is, the PDO flips back to its cold phase eventually. These phases can last up to 60 years. New farmers just haven’t a clue. They ain’t old enough to know “how does your garden grow”. But then again, for the uninitiated, we can tickle our tongues with over-priced tooth sweet ice wine and be led to think that all is well. By the way, grape seasons are based on number of grow days. As long as grapes have access to the Sun (in any of its phases cause it don’t matter) and above freezing temps at night, grapes will grow. Growers even clip off leaves to bring more Sun to the clusters. The fly in the ointment are the endogenous weather variables. That is what they watch and measure like a hawk if they know what they are doing. Ask them. They don’t care what the Sun is like. If it is shining on the clusters they are perfectly happy with just that single piece of knowledge about the Sun. They care a GREAT deal more about what the weather is like. Here is one more example but from the oceans. Salmon fisheries are much more interested in SST than what the Sun is doing. They could care less about the Sun. It’s the PDO that tells them whether or not to fish in Alaska or off the coast of California. They have been recording ocean temperature for as long as they have been plying the seas for salmon. Why? Because they had discovered that sea temperatures tell them whether or not there will be salmon here versus there, or abundant versus scarce. The PDO was finally theorized based on ship logs. To this day, no one cares what the Sun is doing because it won’t predict salmon tonnage. Only the PDO can. There are many more examples of the important correlations found between weather pattern variation and flora/fauna response that sit completely outside the Sun’s phases. Tree rings. Elk and deer population. Bat numbers. Insect oscillations. The list just goes on and on. Not one of these correlations follows Solar phases. Not one. A) the last time “this” happened was almost 100 years ago. I do not know about the rest, but I have researched a bit on the tree rings. Actually the sun cycles were discovered in the counting of the thickness of tree rings, back last century, and I have been for a while now asking for chapter and verse where this “folk” science wisdom has been proven wrong. Chinese pine in the Qianshan mountains were also affected by climate changes on a hemispheric and global scale. There were 11-, 23-and 50-year-common periodicities between the chronology and solar activity and 10-, 20-and 45-year-common periodicities between the chronology and geomagnetic activity. The tree ring time series extended over a period of not, vert, similar400 yr. Spectral and wavelet analysis techniques were employed. We have found evidence for the presence of the solar activity Schwabe (not, vert, similar11 yr), Hale (not, vert, similar22 yr), fourth-harmonic of the 208-yr Suess cycle (not, vert, similar52 yr) and Gleissberg (not, vert, similar80 yr) cycles. Pacific tree ring data correlates to PDO in near perfect synchrony and with a reasonable mechanism. It has therefore been used as a PDO proxy going back to the 17th century. China trees also correlate very well to oceanic oscillations. Again with the requisite mechanism. This is a stronger case than solar correlations that are not nearly as tightly correlated and with no mechanism. Therefore the strength of the validity between the two theories is on the side of oceanic oscillations. The sun has just reverted to where it was 100 years ago and we are are lot warmer, so it seems that the Sun has little to do with it. Google “PDO and tree ring data”. Google “SST and tree ring data” for more global studies. This theory is well documented and studied. It has been reliably repeated and has mechanism validity. SST and solar variable studies do not rise to this level of correlation and are, in my opinion, without reliability and validity merit. With all due respect, why bother with the analysis if the PDO causes paralysis? There is noise to be found in anything. Tree rings: If the noise of the current age sits above the medium, you have a warm phase. If it sits on zero, you are in between. If it sits below zero, you are in a cold phase. The tree ring readout is consistent enough in that regard to be valid. There is also noise in the ocean temps and where the cool/warm waters lie, otherwise we would not have El Nino’s/La Nina’s. We surely do have them. What makes the PDO flip? Are we to believe that it’s vector is self-driven? Don’t paralyse the analysis by stopping at PDO. It also shows the Mount Wilson data [fitted to match the Stanford data where they overlap – talking into account the upgrade of MSO in 1985.92]. I would expect the polar fields to continue their recent decrease as the new cycle begins to kick in. Where do I find the RAW data? All images are normalized in background to 09/22/08 image. They represent the deepest umbral difference to background. The last big sunspot group of SC23 is included as a reference point. The minimums of 1901 and 1913, when they were finished with thier quiet periods, they didn’t monkey around and got very busy pumping out spot swarms. 2008/2009 have had thier 2 big quiet periods, and if this is a repeat of 1901 or 1913, it’s time to produce. If 2009 produces in the next 6 mos., fine. It’s a match. If it does not, it’s a new animal. Flip through them and judge for yourself. Perhaps someone with the requisite program can produce an mpeg. I’m the original ‘originator’ and the filtering has end-effects and should not be misused the way you do. As one of ‘the unwashed masses’ as you put it so graphically, believing in witchcraft and magic potions, I am prone, or even deliberately inclined to abuse science, in primitive desire to subvert the whole of the human endower. Now, it is partially your failure not to deduce the above, since you kindly introduced me to your polar fields theories. provoking your never cessing anger, so I resorted to a different approach. it its impeccable symmetry. Although scientifically accurate for calculating an average of two poles, it is something you might achieve by applying a noisy AC (alternative electric current) trough a solenoid, i.e. achieving an absolute symmetry at each pole of the solenoid. Now, you and I may not agree about electric currents role in the generation of polar fields, although the absolute symmetry of your chart would be more appropriate to my views than yours, I do believe there is a certain asymmetry in polar magnetic content, regardless of its process of generation, even with a strict interpretation of B-L theory. On 20nHz LP filter, (you did explain proces of the annual modulation elsewhere very effectively), since it is purely geometric projection effect, I do not understand reason why you wish to use numerical filtering (with all its shortcomings), and not a simple geometrical recalculation, with all parameters involved having precise and well known values. Sunspots are a second order derivative phenomenon. The F 10.7 flux can’t be fiddled with. I see it is down to 67. The volatility has gone right out of it. There once was a study of tree rings in Canada that showed an 11 year period in hares chewing on the bark. I wouldn’t waste too much time on the solar deniers. They are being wilfully blind and are just taking up bandwidth. Can you tell me if the images on this page are still in the original format as taken from SOHO ie not further compressed. If so I might run the pixel test on them and see what we get for SC24. No, they are exported compressed. I will have to re-do that for your pixel operations. As usual it is just because we are moving away from the Sun. The ‘true’ flux is somewhere between 69 and 70. I do not understand reason why you wish to use numerical filtering (with all its shortcomings), and not a simple geometrical recalculation, with all parameters involved having precise and well known values. The filtering is useful as long as one does not misuse it. And the plot I gave tells the whole story. No filtering needed. Where can I find the unfiltered [at least] data? Try it now. They are converted to FITS, then exported through BMP to PNG. I spot checked and the values are not altered except for normalization of background (all pixels are operated on equally). Normally, science images are in the FITS format, 0-65535 or greater. You are always interesting to read, and mostly a breath of fresh air, Pamela… which I note in appreciation of much knowledge and a great deal of pleasure given to me down here in Melbourne, Australia in your comments. If you average a few SST datasets (PDO, AMO, etc.) and subtract them from HadCrut data, the leftover response looks suspiciously solar like. I wouldn’t be surprised myself if the ocean cycles are “kicked off” so to speak by the increase in solar activity, and respond with variability at their own lag factors, thereafter until settled. PDO and AMO were pretty well in phase until the PDO flipped in 1945 (cancelling any net warming from the sun which peaked in 1960), and then AMO lagged by roughly ten years since. I think you have to combine both Oceanic and Solar and then you’re not left with much else to discuss really. It will be interesting to watch the next ten years IMO with PDO going negative again, hopefully AMO soon, and the Solar downturn for SC24/25. I’ll enjoy it…it’s proof time, either CO2 is significant or not, we’ll see…but my intuition (and common sense?) say it’s both Ocean and Solar, and probably the same driver…solar. What did I tell you? Not a week has gone by and we have another comment about the decline of F 10.7 flux. The originator seems to be David Archibald @ (16:23:52). The fine for this repeated comment in error is $3.00. Please pay within the next two days. Thank you. Whose next? Will it be the spring ice graph adjustment? Or perhaps something about the NSIDC not using all the years of data in their average? Agree, for the average field. Perfectly symmetrical for Sole-noid type individual polarities but the ‘Sun is a messy place’. This may seem a trivial matter to some, but it precludes the possibility of running all sorts of analyses properly. Thanks for that, saved me a lot of work. 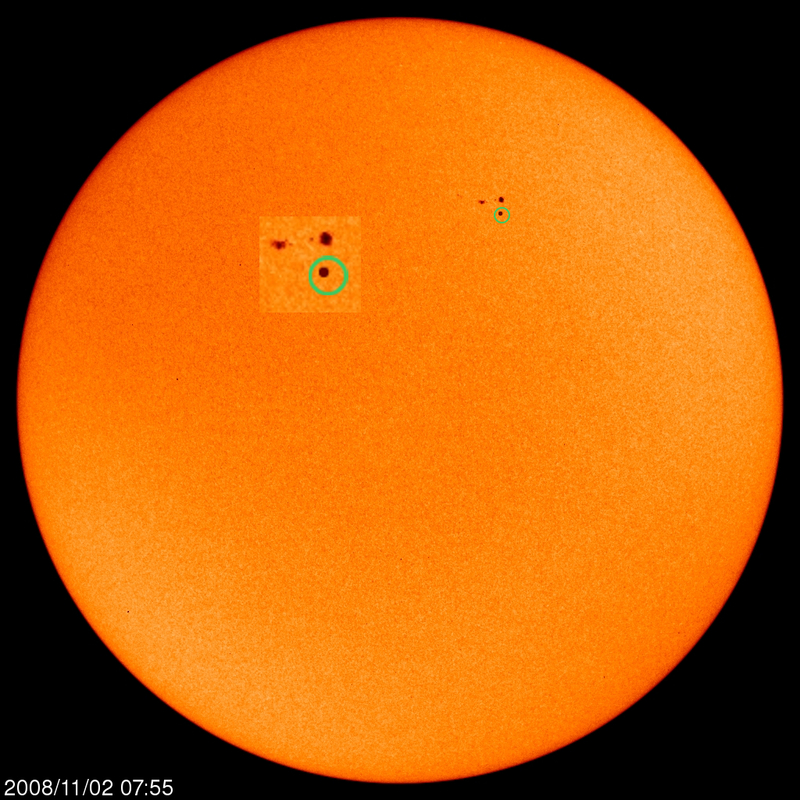 I think there might be 2 sunspots missing, 1 where SOHO was down but one other that should be available. I have assumed a min count of 23 pixels with each pixel requiring a min RGB reading where G>70. This standard method of reading sunspots is supposed to emulate what would have been counted 100 years ago. According to this method (which needs to be cross checked) it shows only 5 sunspot groups made the grade so far for SC24. Perhaps you misunderstood [or I did]. The RAW data is the 30-day average, the FILTERED data is the 20nHz [1-yr] average. You don’t want the individual magnetograms, or the 5-second integrations or the 1000 times per second output from the modulator or anything still finer for a study of the slowly varying POLAR fields. To study other features of solar magnetism, the higher resolution data is there for the asking. Still does not justify your misuse of the filtered data. Let me repeat: you can attach no significance to the last six month of the filtered data. And one more time: you can attach no significance to the last six month of the filtered data. Please report back with your acknowledgement of understanding. Nice. I will check out the missing days and update. How did you come up with G>70 and 23 pixels? Let me repeat: you can attach no significance to the last six month of the filtered data. And one more time: you can attach no significance to the last six month of the filtered data. Please report back with your acknowledgement of understanding. (Salute) Yes Comrade Dr. Svalgaard ! This is, among many other predictions flying about, just another speculation so no need for a repeated repudiation, unless of course there is something to it that I do not know, and you do not like. I think, and I believe that you know, that can not be case. For time being I will refer to this phenomena as Sole-no-id. This in a reference to nearly perfect symmetry of magnetic polar fields symmetry of a solenoid supplied by electric current; just a view of a man with ‘worst case of cyclomania’. I am looking forward to be ‘educated’ about this particular puzzle. The end of report. (Salute). There are two sets of curves, real data [darker colors], and mirror data [symmetric lighter colors]. The latter just put there to make it easier to judge the relative sizes of the cycles [as explained in our paper on this]. So the perfect symmetry is artificial [whenever you see perfect symmetry like that, it is always artificial, e.g. the plots of the torsional oscillation that were shown last week]. What is plotted is the single-valued difference between the North and South polar fields. The differencing does two things: 1) remove the yearly variation due to the varying tilt of the solar axis, and 2) remove any zero level errors, which is especially important for the Mount Wilson data. The WSO website also shows graphs of the two poles separately, and they show interesting differences you might want to speculate on. So the perfect symmetry is artificial [whenever you see perfect symmetry like that, it is always artificial……. The WSO website also shows graphs of the two poles separately, and they show interesting differences you might want to speculate on. Yes, I agree again, symmetry is artificial, so it should not be there. From your graph it is not possible to tell what each pole is doing . WSO, true, shows the graphs, but with the annual modulation, which is an observation input, not actually there in the real polar fields. Come on you can do better, and have a graph showing what is actually happening, with no ARTIFICIALITY, with no observation modulation, just polar fields, otherwise people would be forever confused by your Sole-no-ID (solenid) (short for no ID of solar North and South field) and my subterfuge graphs. have a graph showing what is actually happening, with no ARTIFICIALITY, with no observation modulation, just polar fields, otherwise people would be forever confused by your Sole-no-ID (solenid) (short for no ID of solar North and South field) and my subterfuge graphs. My graph shows the relevant quantity [for my purpose] which is the ‘dipole moment’ and that is with no artificallity, just the observed quantity. Nobody has been confused before [to my knowledge] and your misconstrued graphs are on you. Since the zero level error is not known, it cannot be removed from the data [it is small for WSO, but large for MWO], so my graph gives the best picture we can make of the dipole moment which we believe controls the solar cycle. This procedure sounds wrong if you are just basing the analysis on counting pixels in the image file. The count is then totally dependent on image resizing etc. You need to define a standard focal length for the optical equipment (the telescope and any additional barlows/reducers) and a standard physical *sensor* pixel size for this to have proper meaning. Said in a different way, you need to state the field of view (typically in arcseconds) for each sensor pixel. Then that could potentially be used as a basis for such measurements. and compare 03/26/08 count of 36. First things first. We have to come up with a way to relate what is visible 150 yrs ago with SOHO, which we already know what the resolution is. Then we can transfer that to hemispherical area visible. Patience. Look at the mess the present day counting is in. It’s not going to be that easy, but we’re working on it. Said in a different way, you need to state the field of view (typically in arcseconds) for each sensor pixel. Then that could potentially be used as a basis for such measurements. Or simpler [as is actually done] divide by the number of pixels of the solar disk. Then multiply by 1,000,000 and perhaps [if you really want to be fancy] adjust for projection. I agree there is a mess in the counting, no doubt. What I am saying is that if you want to compare with 100 or 150 years ago and get credible results, there must be a proper way to measure that is based on physics as much as possible, and temporary technology as little as possible. The suggested counting method may work for SOHO images since the optics and sensor is constant. But SOHO was not around 100 or 150 years ago and will not be around 100 years from now. “We have to come up with a way to relate what is visible 150 yrs ago with SOHO” is indeed the challenge. This is meant as constructive input. I follow what you are saying and presenting and find it very interesting, so please continue! My graph shows the relevant quantity [for my purpose] which is the ‘dipole moment’ ………. Haa! “for my purpose”, Is this some kind of a ‘private science’ or a public forum, but I was sternly instructed: “Please report back with your acknowledgement of understanding.” in regard to what I clearly indicated as “This may be just a coincidence …”. True scientific endeavour (spelt correctly this time) requires considering everything that one may get data on. I thought any snippet of information on the Sun, in this current minimum might exercise mind of any solar scientist, let alone the top few. Not to mention Babcock-Leighton theory which teaches us that two poles garner their magnetic crop independently. Now, if you do believe that ‘dipole moment’ controls the solar cycle, than by definition dipole moment is absolutely symmetric, and yet there is asymmetry between two poles. If you take zero as an arithmetic middle value (N-S)/2, it would imply that ‘dipole’ is bobbing up and down in the N-S direction, not to be ignored, just a treat for an enquiring scientific mind. Not one for me. Good night. The idea of visibility level comes from L&P. No matter what the imager or resolution, we want to define visibility as a floor of contrast. Next, by what meets our criteria of visibility, we measure hemispherical area of umbra. Last, we come up with a hemispherical area that is 10 on the ssn scale. That is ideally done by finding old drawings/images that relate to the time before the subspots were counted and interfered. We are helped in this regard by large spots where subspots pale in significance. We believe it’s not only worth it, it’s something that is way overdue. The ‘stern instruction’ was about misuse of filtered data. There cannot even be ‘coincidences’ if you misuse this, only garbage. by definition dipole moment is absolutely symmetric, and yet there is asymmetry between two poles. We do not know how much of that asymmetry is real because we do not know the zero-level error and the plot only uses the single pole-most ‘pixel’ [constant aperture] while the polar cap changes size with time so that pixel is only a rough indicator of the instantaneous polar field and any asymmetry could well be due to variations of the polar cap size, and the ‘for my purposes’ refer to prediction of the sunspot number [or region count] for the whole Sun for which I made the plot, so the symmetric dipole moment is the right thing to use. You would get very nearly the precise same value if you did a spherical harmonics analysis and extracted the dipole component, as was done here http://wso.stanford.edu/gifs/Dipall.gif [the middle panel]. With your propensity for interpreting noise and garbage it seems prudent to stick to data with real meaning. BTW, the N and S filtered data is available on WSO site, just don’t use the first or last six months of the data, and be careful not to overinterpret the finer details that very well could just be garbage. I can only give you the Wilcox part of the data [note I removed the quote marks]. The Mount Wilson part is not on a page – you’ll have to contact them to get the gigabytes of data and do the processing yourself. These WSO data are intended to be the most untouched measure of the solar polar field strength, i.e. presented with the least possible amount of processing. The Sun’s Polar Field strength is measured in the polemost 3′ apertures at WSO each day, north and south. The polemost aperture measures the line-of-sight field between about 55 and the poles. As Earth moves above and below the equator each year the solar coordinates of the apertures shift. Depending on the observatory optics and the date, the square aperture at the pole will be oriented differently on the Sun during each measurement. Each 10 days the usable daily polar field measurements in a centered 30-day window are averaged. Data are updated about once a month. The columns marked N are for North, S are for South. And in return you owe me to explain ‘the central thesis’. The G value looked like a good value to compare darkness and seemed consistent across many spots. The 23 pixels is a first pass and open to suggestion but the main criteria was to establish a min sunspot size so that sunspecks would not be included like they are currently, in an attempt to level the playing field….we seem to be heading into the realm of the ridiculous. Here is a pic of the manufactured suggested std sunspot (inside green circle) shown along side sunspot 1007 as a reference. so that sunspecks would not be included like they are currently, in an attempt to level the playing field….we seem to be heading into the realm of the ridiculous. Wolfer advocated and changed [starting ~1882 as Wolf’s assistant, but in full force after Wolf’s death in 1893] Wolf’s admonition of not counting pores and specks. Since then every sunspot observer and ‘producer’ have followed Wolfer, so to get a comparable count, one MUST count the pores and the specks. I agree that this is silly, but that is the rule. If you change the rule, we get yet another, different series that we don’t know how correlates with the historical data until we have several cycles worth of overlap, so we can cross-compare. One of Wolfer’s sins was that he didn’t run the two methods in parallel long enough [perhaps because he knew that it would be almost useless anyway as he had already ‘contaminated’ the official series with his own counts]. From whatever meager comparisons he made, he suggested a correction factor of 0.6, which we [or I at least] today think is likely not correct. I’ve already plotted the ‘data’ from that page (along with several functions of the ‘data’). … is column 2 minus column 3 from the following? All in all, these measurements are difficult [and we are using 35-year old technology to boot], and care [and some distrust] must be taken in interpreting them. I can definitely see your prototype spot in my 70mm refractor in the real world. Yes, you are correct, and I believe I can see why. There’s no telling how many subspots were counted, and as time goes by, it get’s worse as fainter “nebulae” are drawn in like the Hubble Deep Field. It’s off the deep end. SWPC is counting in to their area number anything that sits just above the background noise. It’s open-ended. Would Wolfer have seen some of the specks that have been counted during SC24, the equipment these days is vastly different. Also his changes came after the last grand minimum, so to compare the Dalton to today we need to use a comparable system. During times of grand minima there is a far higher likelihood of sunspecks as L&P are finding out. The periods between grand minima when the Sun is behaving more normal this is not nearly the same kind of issue…its important we dont lose sight of this impending grand minimum and its very different output and make the necessary adjustments to reflect reality. We certainly can run a parallel system. Would Wolfer have seen some of the specks that have been counted during SC24, the equipment these days is vastly different. Yes, he would. And the very same telescope still exists and is being used for sunspeck counting as we speak: Figure 1.2 on page 11 of http://www.leif.org/research/Friedli2005.pdf I’m trying to get their counts. There is no sign of any impending Grand Minimum, just of some low cycles like during the 1800-1820 period and 1900-1920. You continue to deny the Dalton Minimum, most likely because its the most common type of grand minimum that occurs on a regular basis and defies the logic of the Babcock-Leighton theories. The Leif Svalgaard universe certainly is a strange place. There was a minimum like in the early 1900s and coming now, but they do not qualify as Grand Minima [where there were an order of magnitude or two less visible spots]. And there are no signs of an impending Grand Minimum, only speculation. or it could be as deep as the Maunder but as brief as the Dalton. Existing theory says 2 very bum cycles, which says Dalton length. We are along for the ride. Like the man said, take your best guess, come up with a test for being right, and wait. In the meantime, I am seeing a ton of work to go through the ssn records and make a system with data that takes us into the age of technology no matter how improved it gets. Somebody has to do it. (doing nothing is not a solution). Thank you for these useful notes. Here is a graph with first and last, not 183 days but 4 years truncated, so no garbage here. N – S ASYMMETRY IN INTENSITY OF THE POLAR MAGNETIC FIELDS. If this difference is an artificial result of measurement application, than that should be made clear or date appropriately corrected. Since there is N/S asymmetry in the SSN count and Area, I do not see a reason why one should not exist in polar field strength as well, and if it does than it must have some meaning to it. WSO wisely publishes delayed data (for 30 day averaging), filtering should be also delayed for appropriate period. Simple mathematical recalculation could correct for the geometric projection effect (I initialy assumed), no need for numerical LF filtering, with all its drawbacks, of which I am extremely well aware of. since it was based on misuse of filtered data. Of course there is, as there is some meaning to the pattern of tea leaves. We do not know how much of the asymmetry is real and how much is instrumental or, more importantly, introduced by my decision to label the measured value in a single pixel as ‘the polar field’. No, we disagree, as the correction can only be done if we assume a model for the distribution of the field, e.g. that it is radial, or has a specific non-uniform distribution, and we do not want our model assumptions to influence the data. no need for numerical LF filtering, with all its drawbacks, of which I am extremely well aware of. Perhaps now, after my ‘stern instruction’, but certainly not when you made your first comment on this [see above]. Now, for that other matter …. 1. I accept that current appearance of the polar field divergence is not real, but product of numeric filtering (although I did qualify my statement that any interpretation of it significance may be a coincidence). 2. My observation was made under wrong assumption that geometric projection errors are calculated and automatically applied to each set of measurements, instead of floating numerical filtering as may be applied by WSO, in which case I think data should be withheld until such time as most of the filtering effect is out. Depending on the formula used, filtering effect could never be completely eliminated, so it would be useful to quote 2 critical points (considering it is intensity; 6 &12 db down). Filtering in analogue electronic communication circuits is an important factor but it has serious side-effects, numerical filtering in digital circuits is more flexible but not fully devoided of problems, and I happen to be familiar with both types. 3. In past a certain amount of ‘apparent asymmetry’ has been recorded but its meaning and origins are not entirely clear, and a future investigation may revel (if it does exist) does it have any consequential or causal relationship to the N/S asymmetry during the previous and subsequent cycles. instead of floating numerical filtering as may be applied by WSO, in which case I think data should be withheld until such time as most of the filtering effect is out. It is always inviting trouble to change the format of a long-used dataset, so we’ll not do that, but rely on common sense on behalf of the users. still stands and I’m awaiting a serious reply. I have on my desk a strong magnet. At some distance from it an iron key can still feel the magnetic field, right? If I move the magnet across the street, there is still a magnetic field in my office [albeit much weaker], right. Are there any currents in my office or at the Earth in the first example? The only answer that experiments give is “no”. So we have in one region of space magnetic fields without any currents in that region, right? As an engineer trained in electronics I was more than surprised (better word would be shocked) by Dr. Svalgaard ignorance of electro-magnetism basics. Here is a simplest explanation of permanent magnetism quoted for the most basic understanding. Ampère model: where all magnetization is due to the effect of microscopic, or atomic, circular “bound currents”, also called “Ampèrian currents” throughout the material. For a uniformly magnetized cylindrical bar magnet, the net effect of the microscopic bound currents is to make the magnet behave as if there is a macroscopic sheet of electric current flowing around the surface, with local flow direction normal to the cylinder axis. (Since scraping off the outer layer of a magnet will not destroy its magnetic field, it can be seen that this is just a model, and the tiny currents are actually distributed throughout the material). The right-hand rule tells which direction the current flows. The Ampere model gives the exact magnetic field both inside and outside the magnet. It is usually difficult to calculate the Amperian currents on the surface of a magnet, whereas it is often easier to find the effective poles for the same magnet.